The Temple of Edfu was buried under centuries of sand and silt until the nineteenth century, when French Egyptologist Auguste Mariette rediscovered the site. The complex is one of the most well-preserved sites in Egypt today; its architecture is very much intact, and the building contains a wealth of legible inscriptions on its walls. It is dedicated to the falcon god, Horus. The temple was built on top of much older ruins dating back to Ramses III, and was constructed over the course of 180 years under a variety of rulers during the Ptolemaic period in Egypt. This period represented a time of Greek rule; each pharaoh was a descendent of Ptolemy, a general in the army of Alexander the Great who took control of the region a few centuries prior to the construction of the temple. However, the temple embodies the traditional architecture of ancient Egypt and is largely free of Hellenistic influence. The temple itself is dedicated to the worship of the Egyptian god Horus, who was frequently merged with the Greek god Apollo. In fact, the city of Edfu was renamed Apollonopolis Magna during Greco-Roman rule in Egypt. Several of the inscriptions found at the temple of Edfu describe what is known as the “Sacred Drama.” The story describes the conflict between Horus, the deity of the fertile Egyptian lands near the Nile, and Seth, the deity of the surrounding Egyptian desert, as Horus seeks revenge for the murder of his father, Osiris. This story was ceremoniously reenacted by the ancient Egyptians each year at the temple complex. 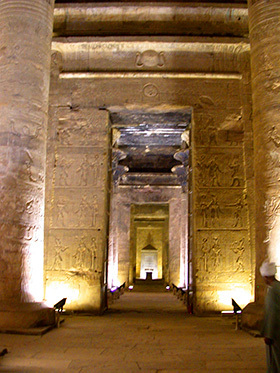 Image: Edfu Temple – passageway to the Holy of Holies. Taken by the Rosicrucian Egyptian Museum. Rosalie, David, Discovering Ancient Egypt. Facts on File, New York, 1993.